This was a baseball 'doubleheader', New York style! For his birthday, Michael got tickets to a Cyclones game. We had been wanting to visit Coney Island, and to couple it with a Cyclones game only seemed fitting. After purchasing the tickets and looking at the New York Mets schedule, we realized that they were home on Sunday against the Florida Marlins, the same Florida Marlins that Michael's favorite player Miguel Cabrera played for! Headed out on Sunday morning with a psuedo-traditional stop at Bingham's in Lenox for breakfast. 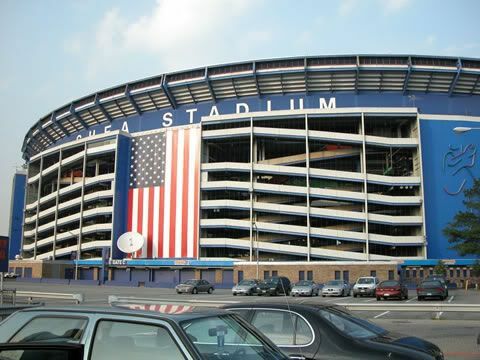 After some easy driving through light traffic in New York City, we arrived at Shea Stadium around 11:00. Our goal was to get there early enough to check out the stadium and watch some batting practice. We were able to do both, with some time to spare (the game didn't start until 1:10). Our seats were in section 12 in the Loge seating, row K, on the aisle. An exciting game, with the Mets coming back in the bottom of the 8th courtesy of a David Wright home run into the left field bleachers! After walking around Shea for a bit, it's easy to see why the stadium is being replaced. In this age of perfect sight lines, large concourses, lots of food options, as well as other fan amenities, Shea just doesn't measure up. It is Shea though, the stadium the Miracle Mets won in, the stadium the '86 Mets captured another title, and the stadium the Mets have called home for the past almost 40 years. 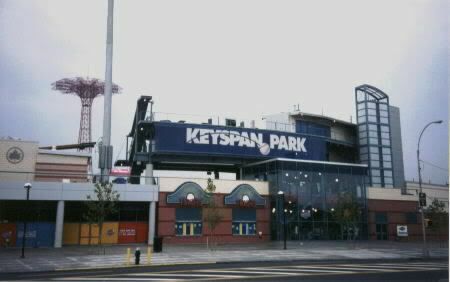 A bit of nostalgia wells up inside of most diehard Mets fans when they think of Shea (this Mets fan included), but the prospect of a new stadium is equally as exciting. We made our way to Brooklyn, and the Sheepshead Bay area after the game to spend the night. We found a nice Comfort Inn on Emmons Ave, about 4 miles from our next days destination - Coney Island. We walked down a few blocks to a restaraunt called Maria's for dinner, and then just relaxed in the hotel room afterwards. On Monday morning, we got up and hit the free continental breakfast at the hotel. After checking out of the hotel, we drove down to Coney Island. Parking was easy as we found a lot next to Keyspan Park that only charged $4.00 for parking! A bargain to say the least in New York City! We walked along the boardwalk and out onto Steeplechase Pier, taking in the sights and getting our bearings. By the time we had done all of this, it was lunchtime and we had worked up an appetite! 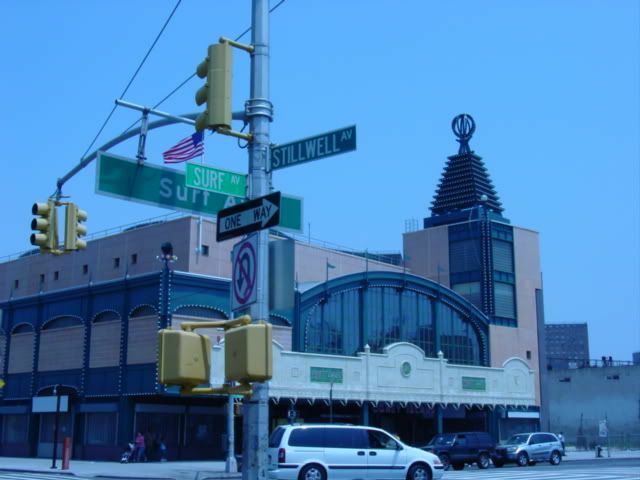 This being Coney Island, there really is only ONE place for lunch - the World Famous NATHAN'S at the corner of Surf and Stillwell! By far the best hot dog I have ever had, bar none. Throw in a serving of cheese and salsa fries and life is mmmm...mmmm...good! This is also the site of the now world famous "Hot Dog Eating Contest", held every July 4th at high noon. A large countdown clock adorns the side of the Nathan's building, ticking away to next years contest. After eating lunch, we headed back down the boardwalk to the New York Aquarium. We spent a couple of hours looking at the various species of aquatic life. NEW YORK (AP) -- David Wright had been struggling, locked in an 8-for-43 slide that had chopped 20 points off his batting average. Then he went hitless in his first three at-bats Sunday. But in a big eighth-inning spot against the Florida Marlins, Wright showed why he will be the National League's starting third baseman in Tuesday night's All-Star game. With New York scuffling and in danger of losing three of four games to Florida, Wright hit a three-run homer that was the difference in the Mets' 7-6 victory. "The last couple of weeks, I haven't felt that great up at the plate," Wright said. "I was just trying to clear my head, just relax up there." Wright guessed that reliever Logan Kensing would try a slider because that's what the Marlins had been throwing him all weekend. "He left one up and I got a pretty good swing on it," Wright said. Wright has 20 homers and 74 RBIs at the All-Star break and the Mets (53-38) lead the NL East by 12 games. "What about that David Wright?" manager Willie Randolph said. "Seventy-four RBIs, most by any Met at the break and another big home run for him. "It's a nice way to end the first half." Joe Borchard went 2-for-3 and scored two runs for the Marlins, who scored three runs in the seventh to take a 5-3 lead. Florida is 27-17 since May 22 after starting the season 11-31. Jose Valentin started New York's four-run eighth with a walk. To Marlins manager Joe Girardi, that was the turning point of the inning. "The big at-bat was Valentin," Girardi said. "Logan had him 1-and-2 and couldn't put him away." Valentin went to third when center fielder Reggie Abercrombie lost Paul Lo Duca's flyball in the sun for a single. Carlos Beltran followed with a run-scoring single off Kensing (1-2) to cut the Marlins' lead to 5-4. After Carlos Delgado flied out, Wright turned the game with his home run. "It felt great for myself and the team," Wright said. Pedro Feliciano (2-2) pitched one scoreless inning to get the win, and Billy Wagner allowed Miguel Olivo's one-out solo homer in the ninth before finishing for his 18th save. New York's Tom Glavine, trying to become the major league's first 12-game winner, had a 3-0 lead after five innings but the Marlins came back. Borchard doubled and scored on Mike Jacobs' two-out, two-run single in the sixth. Borchard doubled in Abercrombie in the seventh, advanced to third on Nady's error in right field and scored on Hanley Ramirez's RBI single. Dan Uggla then hit a sacrifice fly to give Florida a 5-3 lead. "I thought I pitched pretty well," Glavine said. "I was disappointed with the way it came out for me. With a couple of things going my way, I could have thrown a shutout." Glavine allowed nine hits and three earned runs in 6 1-3 innings. He struck out four and walked two. Lo Duca also doubled in a run for New York on a ball that glanced off third baseman Miguel Cabrera's glove. After the inning, Marlins starter Scott Olsen confronted Cabrera in the dugout. "They're OK," Girardi said. "They kissed and made up." "Whatever happened, happened," Olsen said. "We're fine. They'll be no carryover." The Marlins had two runners thrown out on the bases in the first two innings. Ramirez walked leading off the game and was thrown out trying to steal by Lo Duca. In the second, Josh Willingham opened with a double and then was cut down by Nady as he tried to score on a two-out single by Abercrombie. Ramirez went 3-for-4 and scored two runs for Florida. Nady's assist was his third and the Mets 24th outfield assist. ... Nady made a diving catch in the seventh to rob Olivo of an extra-base hit. a-Doubled for Olsen in the 6th. b-Flied out for Treanor in the 7th. c-Grounded into a double play for Messenger in the 8th. 2B: Willingham (17, Glavine), Ramirez (19, Glavine), Borchard 2 (2, Glavine, Glavine). HR: Olivo (10, 9th inning off Wagner, 0 on, 1 out). TB: Ramirez 4; Uggla; Willingham 3; Jacobs; Abercrombie 2; Olivo 4; Borchard 4. RBI: Jacobs 2 (47), Ramirez (25), Uggla (51), Olivo (35). Runners left in scoring position, 2 out: Uggla; Ross. SB: Ramirez (26, 2nd base off Bradford/Lo Duca). CS: Ramirez (5, 2nd base by Glavine/Lo Duca). a-Struck out for Feliciano in the 8th. 1-Ran for Lo Duca in the 8th. 2B: Delgado (14, Olsen), Valentin (14, Olsen), Lo Duca (21, Olsen). HR: Nady (12, 5th inning off Olsen, 1 on, 0 out), Wright (20, 8th inning off Kensing, 2 on, 1 out). TB: Valentin 2; Lo Duca 4; Beltran; Delgado 2; Wright 4; Floyd; Nady 4. RBI: Nady 2 (34), Lo Duca (30), Beltran (68), Wright 3 (74). 2-out RBI: Lo Duca. Runners left in scoring position, 2 out: Wright; Beltran. Team LOB: 3. E: Nady (3, fielding), Lo Duca (6, throw). Outfield assists: Nady (Willingham at home). Pitches-strikes: Olsen 92-59, Tankersley 9-4, Messenger 15-11, Kensing 35-24, Glavine 98-60, Bradford 15-10, Feliciano 10-6, Wagner 13-11. Ground outs-fly outs: Olsen 8-2, Tankersley 1-2, Messenger 1-0, Kensing 0-1, Glavine 4-9, Bradford 1-1, Feliciano 2-0, Wagner 0-1. Batters faced: Olsen 21, Tankersley 3, Messenger 3, Kensing 7, Glavine 27, Bradford 4, Feliciano 2, Wagner 4. Inherited runners-scored: Bradford 1-1, Feliciano 1-0. Umpires: HP: James Hoye. 1B: Charlie Reliford. 2B: Paul Nauert. 3B: Greg Gibson. Wind: 18 mph, Out to LF. 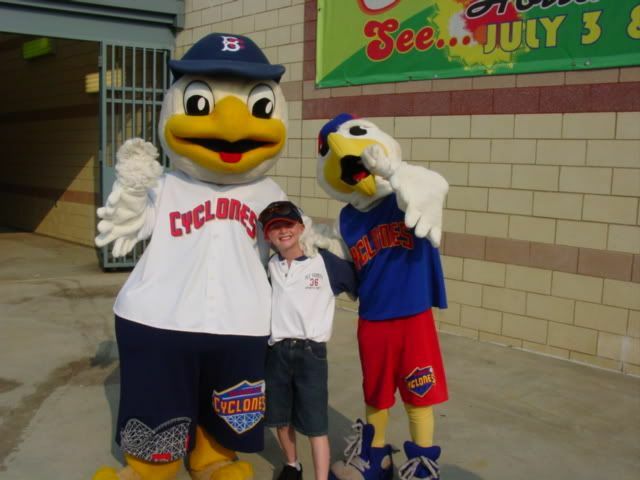 July 10, 2006 - The Cyclones won the last game of the series on Monday, with a 5-4 comeback win over the State College Spikes, thanks to clutch hitting and timely pitching from Brooklyn. Tobi Stoner, who has been one of Brooklyn�s most reliable starters all season, turned in another solid performance, going 5.1 innings and allowing three earned runs while striking out six. Despite the good numbers, Stoner left the game on the short end of a 3-1 score in the sixth, but the Cyclones stormed back in the bottom half of the inning to take a lead they did not surrender. Brooklyn opened up the scoring with an RBI ground out from Jonathan Schemmel in the bottom half of the first. However, State College struck back a few innings later, scoring three times in the third to take a 3-1 lead. The Cyclones quickly came back with a run of their own in the fifth when Jeremy Hambrice drove in Mark Wright on an RBI ground out. Brooklyn still trailed until the bottom of the 6th when Jason Jacobs delivered a clutch RBI double to tie the game, followed by a Luis Rivera RBI that gave the Cyclones a 4-3 lead. They extended it to a 5-3 lead an inning later when a wild pitch brought home Schemmel. The insurance run proved to be a necessary one, as the Spikes plated a run in the 8th off of Grady Hinchman. Clinging to a one run lead, George Greer called on Joe Smith (pictured, by George Napolitano) to close the door. Smith did just that, nailing down his third save of the year for a 5-4 win over the Spikes. With the victory, Brooklyn ended their four game losing streak and improved to 7-13. The Cyclones next home game will be Tuesday July 18th. That night, the first 2,500 fans in attendance will receive Cooler Bags, courtesy of The Dime Savings Bank of Williamsburgh.